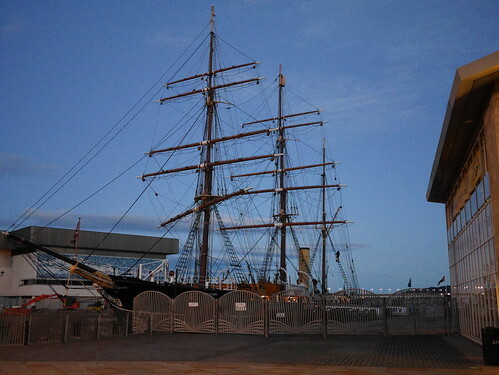 I have just returned from Dundee where I attended the Craft Scotland conference for 2013. 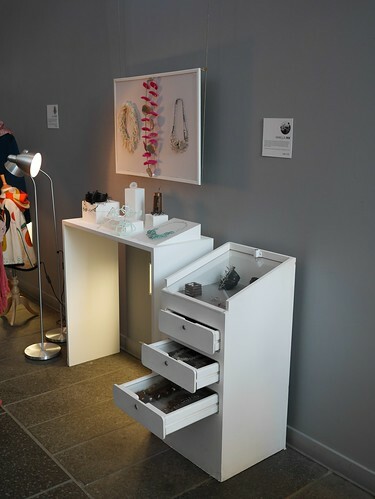 As I have blogged before, I have a lot of time for Craft Scotland. I don't think that there is another national organisation in the world which has quite the energy and enthusiasm for promoting the makers from the country it represents, yet it is a tiny organisation with a huge vision. The British Council, The Crafts Council and the others all do very well, but they seem in some ways a bit hide-bound and finally meeting with some of the positive, buzzing people behind Crafts Scotland was one of the real pleasures of the weekend. 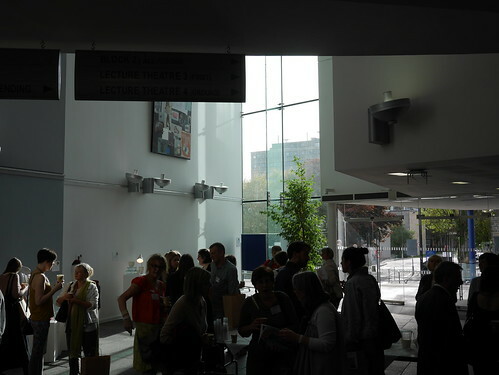 The conference kicked off with coffee and a general introduction. It was great to see Diane King again, whom I haven't seen for about 5 years, as well as Anne-Marie Shilito and also to be introduced to people whom I have never met or who have only associated with me by social media (social media featured a lot in the conference). 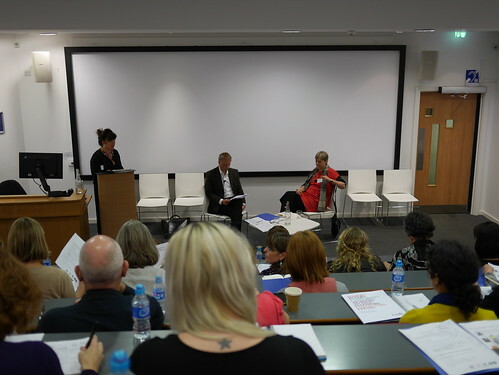 The event was opened by Janet Archer, head of Creative Scotland (some of you may recall me blogging about the problems that this hitherto shambolic organisation had encountered, culminating in the champagne-Cannes fiasco) and Janet has been brought to clean up their act. Creative Scotland oversees and funds Craft Scotland - and I can't help but feel that the names could have been better differentiated - but by some miracle, Craft Scotland seems to have managed to avoid the taint of the previous mismanagement of Creative Scotland. Janet Archer put several peoples' backs up - mine included - from the start of her presentation by suggesting that her background in "contemporary dance" allowed her to understand craft practices by using some vague and wispy dancing around with definitions. To her credit, even she seemed slightly uncomfortable with this idea and rapidly moved on to more believable points such as her determination to get Creative Scotland back on track - something which she does seem to have been achieving - and to continue to support Craft Scotland in what it is doing. The keynote speaker for the event was the charismatic Professor Hans Stofer who spoke wittily and movingly about both his own practice and his beliefs about craft practice in general, beliefs which chimed in deeply with my own - there is always something very pleasing about having one's beliefs (prejudices?) backed up by someone whom one respects! He talked about the need for honesty, how "the need to make a mark is primal and absolute", about his love of outsider art, discussed "the joy of making" and mentioned how his role as a teacher could be described as being that of a "critical irritant". Well, I am sure some of my students would agree with that description of my own role. The main thrust of his talk was about the role of the designer in wider society, about how it is no longer necessary - or even desirable - for art-school graduates to all become artists, about how makers and craftspeople, artists and designers all have a wider role in society as problem-solvers and "different thinkers". While he was optimistic and positive and utterly convincing and I couldn't help agreeing with my philosophic brain, my pragmatic was telling me "the cretinous Gove would never understand". Hans' speech did exactly what is expected of a keynote: it set the tone. 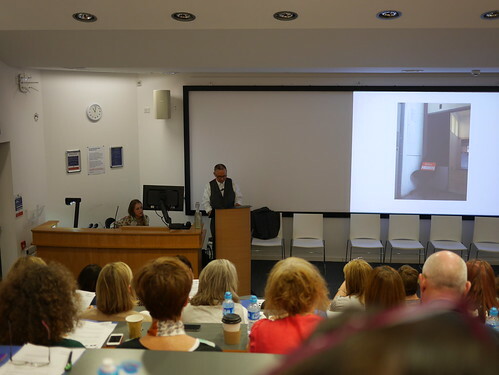 At no point in the following two days did the mood of the conference dip from the optimistic high in which he set it and the organisers, Fiona Logue and Roanne Dods are to be commended on this inspired choice. Hans Stofer was a hard act to follow and some people might have baulked at so doing, especially if they were young, recent graduates and being asked to talk about their deeply personal journeys towards balancing their creative and business practices, often admitting failures and mistakes with painful honesty. From left to right in the above photograph, we have Alex Dobbie, Laura Spring, Catherine Aitken and David Murphy, and Tom and Anna Luntley. Alex, a design engineer, talked about his collaborations with his brother who is a silversmith (you may recall that I was much taken with his work in the Glasgow School of Art degree show) and how they have worked together to solve problems allowing his brother to accept commissions which he might otherwise have had to reject. They are also collaborating on a range of jewellery for mass-production. Laura was probably the most developed of the group of makers and had actually taken her work to full, commercial production and it was admirable the way in which she spoke so honestly and openly about her mistakes and the way she felt about aspects of her production, about the compromises she had to make to get things done and about rejecting offers which while lucrative, were not right for her business or creative practice. 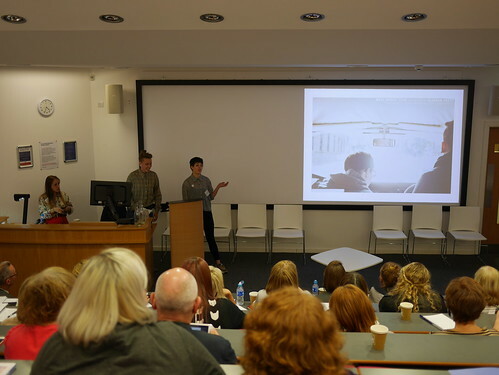 Catherine and David talked about accepting a large commission for the Edinburgh Sculpture Workshops and how they then used the money and the space to create the furniture and fittings for that space. Interestingly, their idea is to use the equipment and expertise already within the workshops to create furniture within budget and which is exactly suitable for the space. Probably one of the most talked-about presentations of the whole two days came from Tom and Anna of "Bakery 47". They are both fine artists and have turned to baking (the dread words "artisan" and "artisanal" featured!) to allow themselves to collaborate as a husband-and-wife team making bread and cakes whilst also making a living. From my own point of view, they are a delightful couple and their idea of making top-notch, fine-quality baked goods as a team is as good as any. 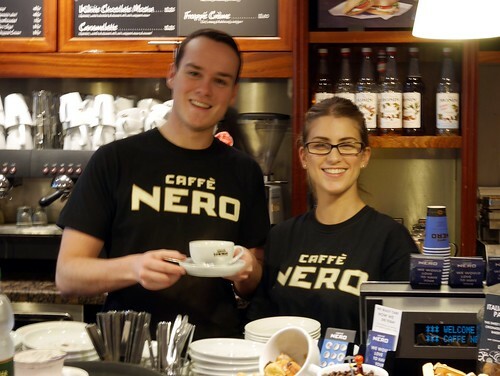 Their "local" ethos is superb but their determination to do it ALL themselves is not sustainable and whilst many people were enchanted by their story - a superb story it is too, most marketable - there were one or two people who dissented enough to say "it is not sustainable" or "they are going to burn out". I wish them well and have even agreed to buy bread from them but I also think that their essential romanticism about "community" and the insular nature of their production is going to grind them down rapidly and I think that this is something which many small makers experience: their work is their life and they don't realise how much work they are doing until something gives. With Tom and Anna, they are very much community-based and it struck me and a few others that their business is perfect for converting into a community enterprise project, something which could then be rolled out into other communities, fitting in with not only their own ethos but with the general Zeitgeist. Yes, all that was a morning's work. During the lunch interval, we got a chance to meet and chat as well as look at Beth Lamont's thoughtfully-curated "We Dundee" craft show of makers from Dundee, including a stand of jewellery from Vanilla Ink (I blogged about them some time ago too!). The afternoon was a bit of a curate's egg and started off with an unfocussed and vague conversation between Amanda Game - an experienced and talented curator with an impressive understanding of Scottish applied arts - and Philip Long, the director of the new V&A at Dundee. Amanda's microphone only worked intermittently, which didn't help anything but at times they appeared to be talking at cross-purposes about different things and the whole event smacked of not having been properly discussed or planned beforehand. 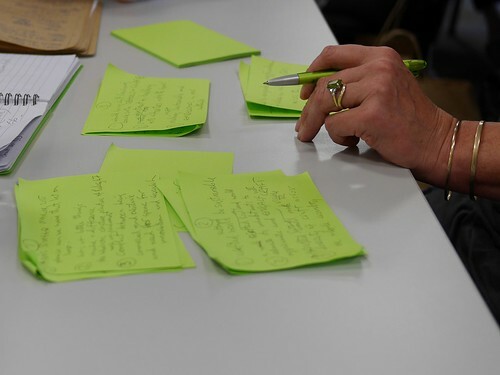 There were some interesting points made throughout the exchange but by the end there were more than a few people scratching their heads and I think there is an irony in that one of the isolated notes I made during the talk says "Precision of language"! One of the useful things I got from the talk was of the idea that a "creative ecology" could be cultivated using "Technology, Talent and Tolerance". This was a disappointing session as both Philip and Amanda are such luminaries that I had been hoping for something a bit more dynamic. After this we all broke up into small groups to discuss the idea of a "Scottish Craft Renaissance", which was just what was needed after spending the morning and most of the afternoon in the lecture theatre and the debates were lively. One of the great advantages of this was that it introduced us all to people we hadn't met previously and allowed us to mix and find out a bit about each others' practices. 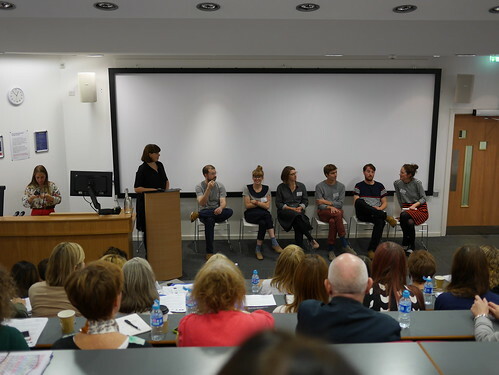 These sessions were the first place where I began to notice that there was an "elephant in the room", the elephant being the divisive and unpleasant one of "Independence" and the confusion between what I defined as "Craft Scotland" and "craft scottish". For me, any development of craft in Scotland has to be real and sustainable; it has to be about small makers and communities of makers and they have to be supportive of each other. What I am not talking about it a bunch of hobbyists selling at a loss or break-even at craft fairs or, worse, selling imported "made in China" tat which they have somehow wrangled a "Made in Scotland" or "Harris Tweed" label onto. A craft renaissance in Scotland has to be about micro-businesses and government, local, national or Salmond's Edinburgh-centric talking shop, MUST take on board the fact that there are loads of efficient, sustainable, ethical and ecological one- or two-person craft micro-businesses out there who do NOT want to grow (such as Natalie Fergie's hand-dyed wool). They do not need to grow and, indeed, growing could wreck their sustainability. Government agencies seem to see growth as the only measure of business success, completely neglecting that someone may live very sustainably on a smaller scale, providing a product or service to a community and in return keeping the economy of that local community ticking over. The tension between "Craft Scotland" and the "Independence" debate was unfortunately not tackled. The one person from Craft Scotland with whom I attempted to discuss it quite understandably stuck to the line that "Craft Scotland" was not involved in politics and while I accept that she has to say this, it is essential that the issue is discussed in some way. 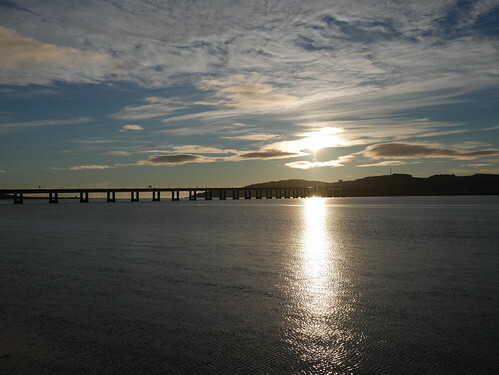 At the moment, anything labelled "Scotland" or "Scottish" runs the risk of being associated with the pro-independence movement; there is a danger that Scottish Crafts - as practiced by any craft practitioner in Scotland, be they a Colombian-born Fair Isle knitter, me or a retired Berkshire-born teacher making ceramics in Fife - becomes associated with the nationalist agenda. As the vast majority of people in Scotland are anti-independence (67% at the last poll, myself included in that number), this could be detrimental to the craft renaissance. I mentioned above that I had the idea that there was a difference between "Craft Scotland" and "craft scottish" and this is another of the issues about which I feel very strongly. I was horrified to discover - I think it was from Laura Spring, but I could be wrong - that a huge volume of Harris Tweed is bought up and shipped to China, where it is made into iPad covers, phone ocvers and the like. This then comes back to Scotland for "finishing" and has the Harris Tweed orb attached and a "Made In Scotland" label put on it. This is not only dishonest but is actually undermining craft practice and one of the roles that Craft Scotland should think about taking on is that of policing standards such as this. Is this a time for the creation of the crafts version of the British Kitemark? Perhaps a uniquely Scottish Craft Kitemark? I realise that not everyone will agree with that. These are just my personal thoughts and I am sure that other participants took away other things. 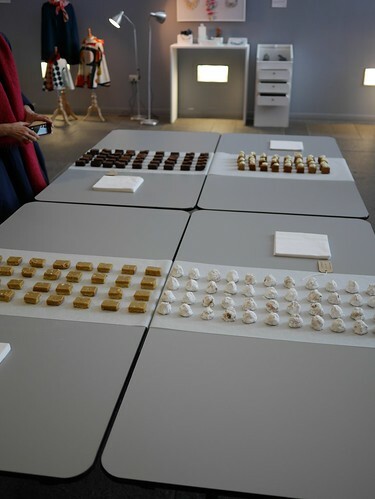 Time to break for Cakes from Bakery 47! Just to be clear, I will say from the outset that I do not think that Fi, Vana, their photographer Ross or their sponsors (Jerwood Trust and Creative Scotland) realise how important, how impressive or how useful this project is. Fi and Vana are funny and personable and while their presentation was dynamic and exciting, their project was more. They set off in a VW Camper van and toured around Scotland for 90 days aiming to visit as many makers and suppliers as they could with a view to creating a directory of all the people in Scotland who could be drawn upon for craft practice: sandcasters, tanneries, jewellers, potters, stone-cutters, knife-makers, weavers, spinners... The only criteria for inclusion in the directory is that the organisation or person had to be prepared to work with anyone else. What this means is that they have created a directory of resources for craftspeople: should I, for example, require a piece of granite cut, I will be able to find out where to do that. One of the advantages of living in a small country! Day two was all about small groups and presentations by a variety of speakers. I am delighted to say that I chose to go to the talk by the wonderful Patricia van den Akker of The Design Trust. 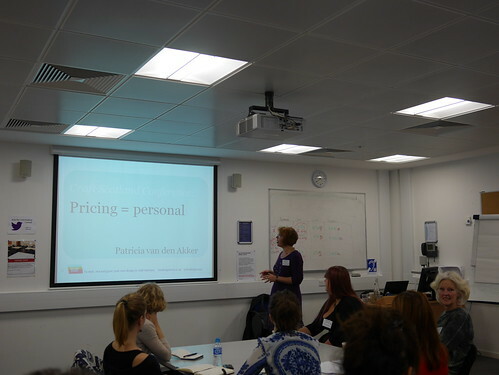 Patricia is a whirlwind of wit, imagination and energy and the first group I went to was her "Pricing Is Personal" seminar. I will confess to having an issue with pricing my work. I think that many small makers do. We get so close to what we are doing that we lose sight of the larger picture. Patricia spoke for almost two hours and not once did she touch on anything which wasn't relevant to the subject in hand. This talk was essential for any maker who feels that their pricing might not be appropriate for the value of their work and she addressed both psychological and economic issues which affect how we price things as well as giving guidance on how to change pricing practice and position your product within the market. When I have attended talks like this in the past, the speaker has often been from a business-school background and it is all about market anaylsis and margins or worse, there are graphs in the presentations. Patricia is a graphic design graduate and her mum ran a gift-shop in the Netherlands; she came to London and started work with New Designers, so her background is not business-school but craft and design, which is refreshing. She understands the issues. I was so completely taken with her presentation that I skipped out of my scheduled afternoon presentation by Maklab - I am already fairly clear about what they do: sorry, Richard! - and went to hers instead, where we learned about diversifying income streams which, again, sounds boring to anyone who is more at home in the studio but which I can assure you that it was useful and interesting and I am very glad that I decided to go to this event. And that was the end. A quick vote of thanks from Fiona and Roanne and we all departed for our various modes of transport home. My own journey home by train was considerably lightened by meeting with Sally Johnston of "Starter for 6" an organisation developing business startups in the creative sectors. I cannot believe that we have never met before as it turned into one of those conversations where we knew all the same people, hung out in all the same places but had never actually even spotted each other! I would like to add that the hobbyist/ enthusiast along with the experience economy is not a concern in an of themselves. The problem is when the hobbyist/enthusiast enter the marketplace selling derivative work based on tutorials, instructions, or copying other makers. The problem is when the hobbyist/enthusiast enter the marketplace selling derivative work based on tutorials, instructions, or copying other makers. They are "Selling Craft Before Its Time." This aligns with The Justified Sinners comment "that poorly-made and poorly-designed goods from anywhere are clouding the public perception of the marketplace for "handmade"." I don't think anyone is bashing hobbyists/enthusiasts, but instead we are recognizing the impact of the experience economy. No sense at all in ignoring the impact. The impact is huge. Read Brigitte Martin post on Crafthaus about her visit to Art Jewelry Magazine. The staff confidently state: "We currently have 30.000 subscribers to Art Jewelry Magazine (paper version and online version combined). By the way, our sister magazine, Bead & Button has 120.000 subscribers!" This is while parallel media specific magazines like "Metalsmith" (with a more serious thought provoking articles and no beginner tutorials) struggle to define their future. And before you start complaining about Metalsmith Magazine ...the articles and content are fine, but it has no tutorials. Another example is the book industry. We all know that publishing is having a challenging time. So what do we see published in every manifestation possible? Book after book with tutorials, instructions, and weekend projects. Do I need to list the titles? Lark Books hasn't even published a "coffee table picture book" in a while, but continues with one tutorial or instructional book after the next. That is an example....here is another one. Workshops. Workshops are the way some very talented makers support themselves. Instead of selling their work at retail, they teach workshops, possibly supplementing the meager workshop fees by selling work at the workshop. Talk bout the "workshop economy." It just makes me sick to think that a recommendation for economic survival is " taking advantage of and control of the hobbyist markets by positioning themselves above these markets and offering services to them." I am not suggesting for one moment that the blame for the failure of craft to capitalise on the market is to be laid at the door of the hobbyists. I am suggesting that poorly-made and poorly-designed goods from anywhere are clouding the public perception of the marketplace for "handmade". I can lay part of that blame at the door of the hobbyist; another part, I squarely tackle in the observation about Harris Tweed. As to the "disloyal bastards", well, I would say "hypocritical" and charge craft practitioners who - unlike ourselves of course! - don't buy handmade. You really made me laugh some time ago with your observation that "Your fourteen-year old son couldn't have made that better" or words to that effect. I think that THIS sort of attitude comes as a direct result of the perception of craft through the filter of the hobbyist. Now we're bashing "hobbiests" as the reason for craft's failure in the marketplace? Really!? And all those "collectors" who are now experiencing craft for themselves instead of buying our work - what disloyal bastards! I worry about what we will do when we run out of scapegoats. Harriete, I really wish you could have been at the conference. You would have loved Patricia van den Akker of "The Design Trust". She kept hitting nails on their heads all day on the Sunday and gave us a talk on how to diversify income streams, which included craftspeople taking advantage of and control of the hobbyist markets by positioning themselves above these markets and offering services to them. I think that makes a lot of sense. Please do post your comments about the hobbyist and enthusiasts and their impact on makers. I would love this discussion to open up. As ot the makers supporting each other, I think that the patrons are still there but I was really annoyed with that one person who said that they wouldn't support other makers: if we don't believe in our craft and the crafts of our fellow makers, who is going to? It isn't so much about creating an autophagic system but one of saying, "I have faith in the hand-made object" and almost becoming an advert for makers generally. Now, I realise that this is a potentially expensive strategy and that most makers cannot afford to pursue it as a way of life - I know I can't and do own H&M Teeshirts! -but my issue was more with the absolute rejection of other makers by someone calling themself a "maker", as well as the issue of the discontinuous mind, where people isolate their craft practice from that of others and lack empathy with the - often financial - struggles of others. The struggle to be a successful craft practitioner is something which the hobbyist will never understand.
" when I was pointing out the importance of makers supporting each other." At one time the craft community extended itself to the customers or patrons that supported craft by making a purchase. This is a lot of reading....and frankly, I missed this comment the first scan....so I am highlighting it here. "For me, any development of craft in Scotland has to be real and sustainable; it has to be about small makers and communities of makers and they have to be supportive of each other. What I am not talking about it a bunch of hobbyists selling at a loss or break-even at craft fairs...."
Thanks, Brigitte. I am pleased to say that in the UK there is a growing and enthusiastic resistance to this sort of nonsense and there was some talk about creating genuine "cultural tourism" which rejects the inauthentic. One of the dyers I spoke to invites tourists into her studio to see the dying happen and has found this a good way of selling hanks of wool (to tourists!) as it is truthful in a way that plastic pipers - stamped "Made in China" - can never be. I am sorry to hear that the same is true of the US. My own experiences there have been largely filtered through a veil of friends and good guidance and the only experience we had which was culturally nasty was in the Empire State Building, where I have never seen so much tat in one place. I did think that Harriete would have enjoyed the event enormously. She would have really appreciated Patricia and I cannot imagine the energy they would have generated together! Quoting from the above blog: "What I am not talking about is a bunch of hobbyists selling at a loss or break-even at craft fairs or, worse, selling imported "made in China" tat which they have somehow wrangled a "Made in Scotland" or "Harris Tweed" label onto." --- Unfortunately, this seems to be an issue all over the world, it definitely is in the US. It's galling to witness and many fine professional craft people have tried rallying the troops to educate and raise awareness about the issue - my good friend Harriete Estel Berman is one of them and she will probably respond shortly as well. Thanks for posting about your experience in such great detail!! !